The P3100 Models are available in single or dual piston formats for increased operating ranges. Units can be supplied in psi, bar, kgf/cm², and MPa. These robust instruments are highly accurate, quick and easy to use. Units feature a built-in priming pump for large volume applications, piston flotation indicators and a high quality screw press for fine pressure control. The P3100 Series is the culmination of over 50 years of experience in the production and design of high performance pressure standards. With features designed to improve accuracy and performance, increase reliability and simplify operation these deadweight testers can be used to calibrate virtually any pressure sensing device, including transducers, transmitters, gauges or pressure switches. Each instrument is supplied with a detachable lid which makes it neat, compact and easily portable. The weight masses are stored in a high-quality case with a self locking mechanism to protect them during transit. All units are provided with an accredited calibration report, weight mass details, M14 x 1.5, M20 X 1.5, 1/8 inch, 1/4 inch, 3/8 inch and 1/2 inch NPT and BSP female adaptors, operating fluid (where applicable) and spare seals. The piston/cylinder assemblies are manufactured to the very highest standards with certified accuracies traceable to international standards laboratories such as the National Institute of Standards and Technology (NIST). Deadweight testers are the high performance pressure standards for pressure measurement. Utilizing the well proven piston-gauge system consisting of a vertically mounted, precision lapped piston and cylinder assembly, accurately calibrated weight masses (Force) are loaded on the piston (Area), which rises freely within its cylinder. These weights balance the upward force created by the pressure within the system. 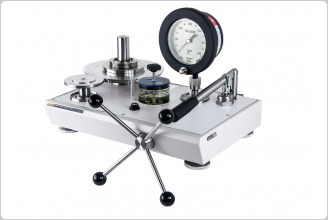 The pressure is measured when placed on a correctly spinning and floating piston. The total pressure measured is the summation of the weights plus the piston weight carrier assembly. There are three basic variations in the hydraulic offering; single low pressure, single high pressure and dual piston models. 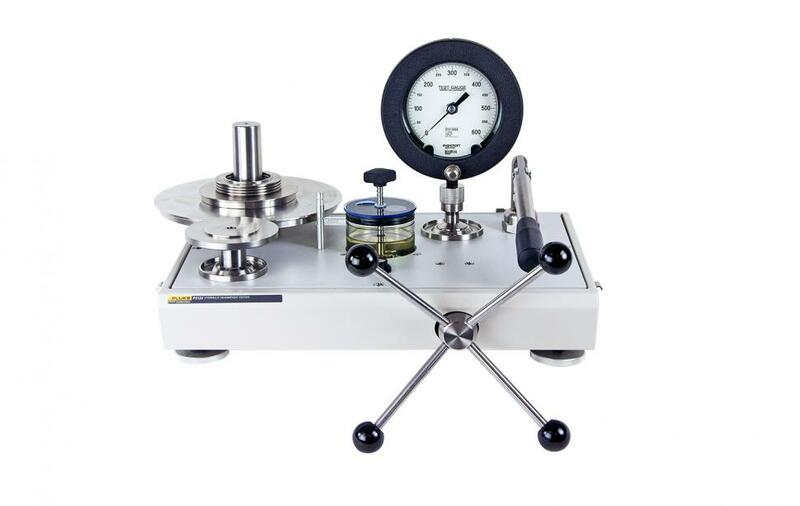 Pressure is generated and controlled by means of a high quality screw press located on the front of the tester. A built-in hand pump is included as standard for all hydraulic models to prime the system and accommodate large volume requirements. The piston/cylinder assembly is the heart of each deadweight tester. They are manufactured from materials that provide stability, durability, and low thermal coefficients and distortion. Our experience and knowledge of piston/cylinder production and calibration ensure the precision and performance required for today’s demanding calibration requirements. Standard weight masses are series 3 nonmagnetic austenitic stainless steel. Each mass is marked with the serial number of the instrument and the nominal pressure value relative to the high or low-pressure piston, when applicable. Optional fractional weights are stainless steel and/or solution heat treated aluminum. Gravity varies significantly with geographical location and this variation has a direct effect on the force of the weights and the accuracy of the deadweight tester. 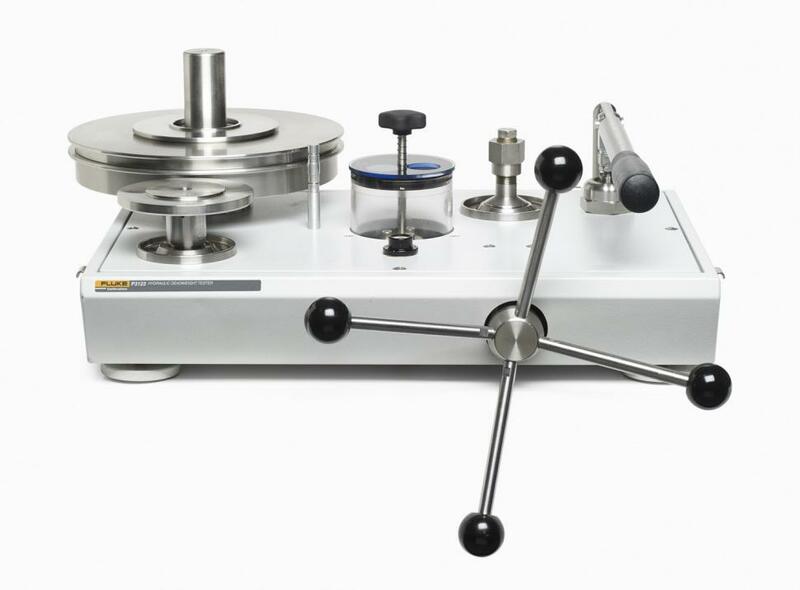 Each instrument can be calibrated to local gravity at no extra cost. If unspecified, instruments will be calibrated to Standard Gravity at 980.665 cm/s2. *Accuracy based on % of reading from 10% to 100% of the piston range when used in accordance with the corrections found on the calibration certificate. Below 10% ± (accuracy class) x 10% of the piston range. PressCal Software Windows-based software program that allows users to easily apply all necessary corrections to enhance the deadweight tester performance. Calibration details are then stored and/or used to automatically create a calibration certificate. 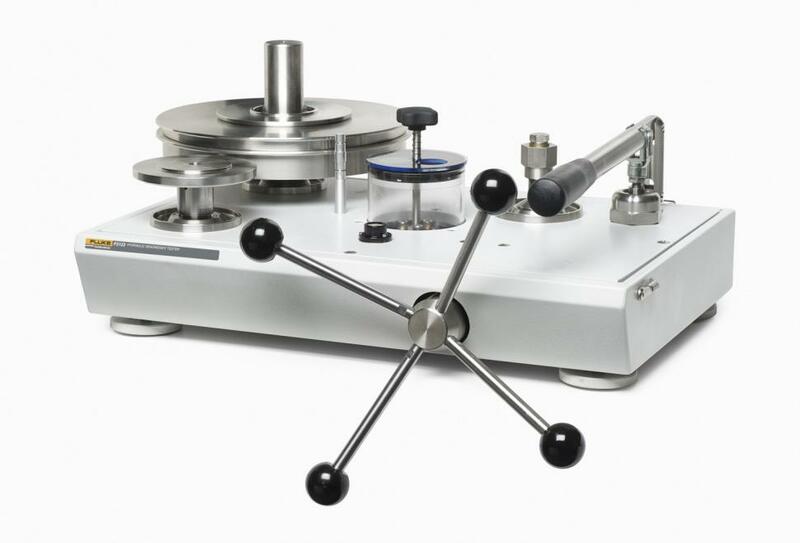 PressCal is provided as standard with all 0.008% instruments. These liquid-to-liquid separators connect directly to the test port of a hydraulic deadweight tester or comparison test pump. A flexible diaphragm separates the fluids, protecting the calibrator from contamination, and allows calibration of the device in its specific working fluid. 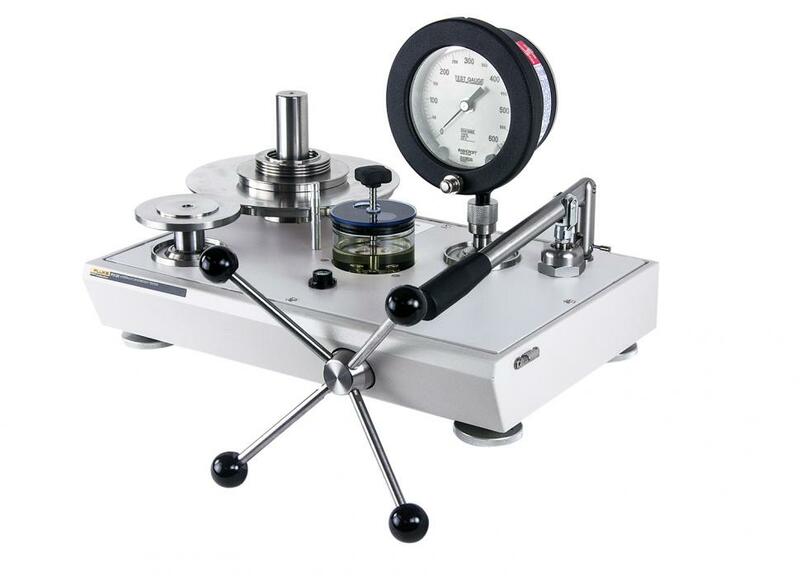 For high pressure pneumatic calibrations this unit interfaces with hydraulic deadweight testers providing a rateless liquid-to-gas separation. 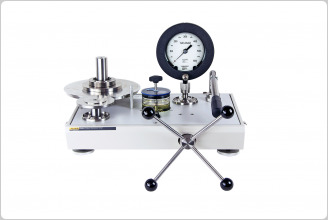 Driven by a pneumatic pressure source (nitrogen bottle) and controlled by needle valves, high pressure gas is balanced against the liquid in a hydraulic deadweight tester through a series of fluid traps. * Note---since fluid mist may be transferred during operation we do not recommend this device for oxygen safe instruments using an oil operated deadweight tester. To calibrate gauges with the pressure connection on the rear (for example, panel mount gauges) in their correct operating position, an angle adaptor should be used. The angle adapter uses the standard gauge adapters and positions the gauges at 90º. The maximum working pressure of this unit is 10,000 psi (700 bar). 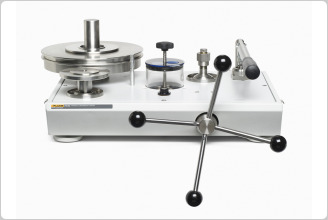 This adapter mounts directly to the test port of the calibrator and allows for the calibration of two instruments at the same time, or the connection of a reference test instrument. Maximum working pressure is 10,000 psi (700 bar). This tool is designed to quickly remove and consistently refit the pointer of a pressure gauge. Fluke Calibration Priority Gold Instrument CarePlans are available for most calibration products. Please contact your local Fluke Calibration sales representative for details or to request a quote. You may also call the Customer Care Center at 877-355-3225 or send email to [email protected]. Fluke Calibration Silver CarePlans are available for most calibration products. Please contact your local Fluke Calibration sales representative for details or to request a quote. You may also call the Customer Care Center at 877-355-3225 or send email to [email protected].